Timber is one of the oldest building materials, perhaps next only to stone. A material with a rich history, timber has been used to build a wide range of structures and the fascination for this material in building design continues to this day. Austratus has a real passion for timber in all forms and for a range of applications. This article explains the many reasons behind Austratus’ passion for timber, especially timber ceilings. Timber ceilings deliver a broad range of benefits to the building with properties such as weather resistance, thermal performance and lack of electricity conduction as well as acoustic benefits making it a highly desirable material in many construction projects. Timber is considered an excellent insulator in building design. The natural pockets of air in the grain of the wood combined with the storage of heat (or cold) within its cellular structure make wood 400 times better than steel, and 1,770 times better than aluminium when it comes to insulation properties. Widely used in Australian houses (namely the Queenslander style), timber allows houses to stay cool in summer and warm in winter, helping reduce energy consumption and power bills without compromising thermal comfort for the occupants. Timber ceilings are extremely low maintenance; depending on the species and grade of timber, the ceiling will need to undergo treatment once every five years or so. Upkeep in the meantime, is limited to keeping the timber clean, which will help with the longevity of the finish. However, when it comes to timber, the natural wear and colour change are desirable characteristics in the design industry. Western Red Cedar, a popular species at Austratus is an extremely durable timber, and ideal for all types of design and construction applications including timber ceilings. With natural preservatives protecting the timber from moisture, termites and decay, these ceilings will stand the test of time. Timber is a beautiful and extremely versatile material with widespread use in diverse construction and design projects. Be it in feature walls, cladding, panelling or ceilings, the striking visual appeal of timber’s natural grain, colours and ambience will always be noticed when stepping into a room. The many shades of timber can help light up a room and introduce a relaxing and soft ambience. When used correctly, a timber ceiling (or feature wall) can make a room look and feel much bigger and brighter. Austratus timber ceiling systems deliver excellent soundproofing and acoustic performance to the installed space. 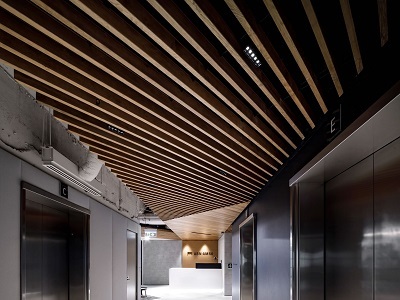 Ideal for open plan offices as well as public spaces, timber ceilings in a slatted design allow noise to travel around and through, instead of bouncing from wall to wall. The Austratus system has been proven to achieve a Noise Reduction Coefficient (NRC) of up to 0.9. Key features of Austratus’ timber ceilings include patent-pending clip-in system simplifying installation and reducing turnaround time to two days; and railing system allowing for continuous lengths of timber to be simply clipped into place to form a suspended ceiling. Austratus manufactures all the parts necessary and ships them all together as one system, eliminating the need for customers to source parts from multiple companies. Austratus can also supply specially engineered finishing trims and stops for added convenience.